Fortunately, the challenges at the start of this portable sawmill service work were surmountable, and were surmounted. As well, these lows led to the resulting high of this great day in La Porte, Indiana, with the Janas family. As is my usual, I do the “milling preps” the day before, and started this work about 11 a.m. I fetched the mill, and towed it down to the house and garage, where is available all of the necessary tools and equipment. Don’t ya know, the mill would not start. It turned over just fine, but there was no indication that it was even thinking about starting. Five hours was spent troubleshooting this problem, and before it was over all of the engine covers were off of the machine, I had found some mouse damage to wiring (not the problem), and I had narrowed it down to a fuel delivery problem. I was getting spark, and there were no apparent issues with air delivery. In the end, and I don’t know what prompted me to do this, I pressurized the fuel tank; you guessed it, by blowing into it. This sounds a lot like something Jeff Foxworthy would say, “you might be a redneck if…!” If you blow into a fuel tank! The Wood-Mizer has a mechanically driven fuel pump driven off of the valve train; I had already checked that for a holed diaphragm, no problem. Best I have determined, it was the fuel filter preventing the pump from drawing fuel up from the tank; a spare filter was on hand, problem solved. I had come close to calling the customer to reschedule, but as Napolean Hill says in Think and Grow Rich, when you are thinking of giving up is likely when you are just three feet from gold. Don’t give up. It wasn’t over, yet! I always plan to arrive, using GPS, at least 10 minutes before I have scheduled, and this job was no exception. On my way though, I suffered a flat tire on I-94, with the Wood-Mizer in tow of course. Newer tires, 40,000 miles more or less; this is my third set of these tires on the Jeep, and I got 95,000 miles out of each of the first two. It turns out it was a puncture, but of course that wasn’t known that at the time. The good news was it was on a right side tire, and I had pulled off on the right shoulder of the interstate. I immediately texted the customer, and then went to work mounting the spare, looking over my left shoulder constantly to make sure that I was not “collected” by some less-than-fully-attentive driver. The tire cost me 30 minutes; I sent the customer another text with updated ETA as soon as I was back on the road. Whew! By the time I got to the job I had sweat clear through my coat. Not stopping three feet from gold. Not. Then the gold showed up. As it turns out, it was the birthday celebration of the elder Joe Janas, and family had come from far and wide to join in the celebration. This is what makes an epic day; the people. We successfully completed the job, which included milling 3 inch Black Walnut slabs, and cutting 30 inch diameter cookies, with everyone having had some hand in that success. We also did some quarter sawing of Walnut, so we exercised that capability as well. 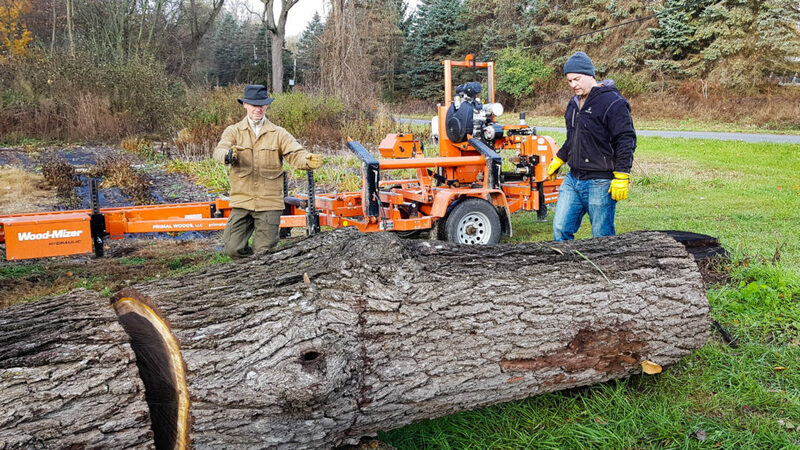 The Wood-Mizer worked flawlessly, and I had a chance to break out the big gun, the Husqvarna 3120XP. I won’t repeat here what I document in the YouTube video I made just below. Many thanks to Joe and Jeff Janas for the images and videos included. Suffice it to say that this is a day I won’t soon forget, and this is a family that I will remember with fondness. A great day in the portable sawmill service business. Thank you for reading, and for watching the short, 3 min 50 sec recap. Thanks David! It was one of those days, difficulties overcome, followed by a super-fulfilling experience. I won’t ask for more than that. Love that background music; hammered dulcimer and banjo. Perfect! I’ll have to give in another listen, but I enjoyed it when I put the video together! Thanks for that feedback.